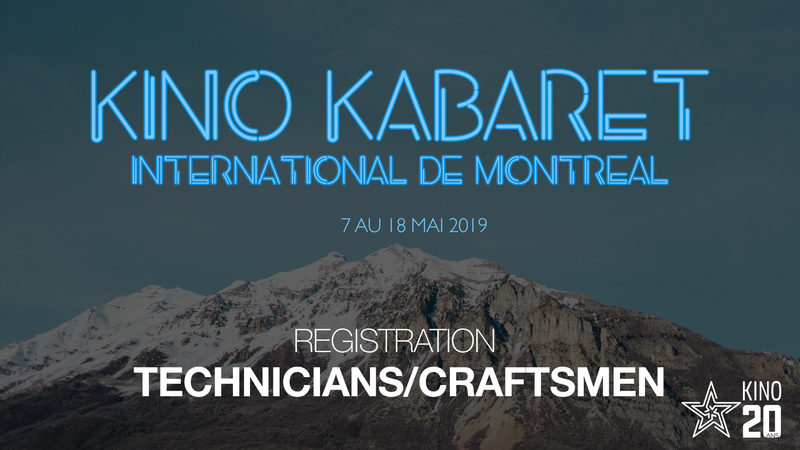 Kino Kabaret International de Montréal 2019 is coming soon! Directors, artisans, technicians and actors from around the world will gather from May 7th to 18th, 2019 to produce short films in 72 hours and this always in the spirit of collaboration and friendship. At the end of this race against the clock, the participants present their films to the public. In addition to screenings, at the Kabaret there will also be several professional workshops, master classes and of course parties! The KinoLab, our headquarters open to all, returns to the magnificent NOMAD (129 avenue Van Horne), coworking space near the Rosemont metro. Your profile in the directory of technicians and craftsmen of Kabaret Free admission to all the screenings, parties and other special events of Kabaret. The Kino Kabaret first try to help the selected filmakers to find accommodations with a local Kabaret participant. Then, the team helps the best we can all other foreign participants to find accommodations during the Kabaret. The canteen prepares continental breakfast and full meals for lunch and dinner. IMPORTANT: Despite all the efforts made on our side to help you, Kino Kabaret can not guarantee you a position in the production of one of the films. It’s up to everyone to be pro-active by participating in the various networking activities. Kino Montréal bien présent aux RVQC !